You probably know that Advent is the stretch of time, beginning four Sundays before Christmas, that commemorates the coming of Christ into the world. To help parents celebrate the Advent season with their little ones, Sparkhouse Family will be releasing a new coloring page each week from the Spark Story Bible. It's easy to print this out for coloring. And as you present the sheet to your child, it creates a natural way to talk to them about what it means to anticipate Jesus--both on the first Christmas and in how he shows himself in our lives every year. 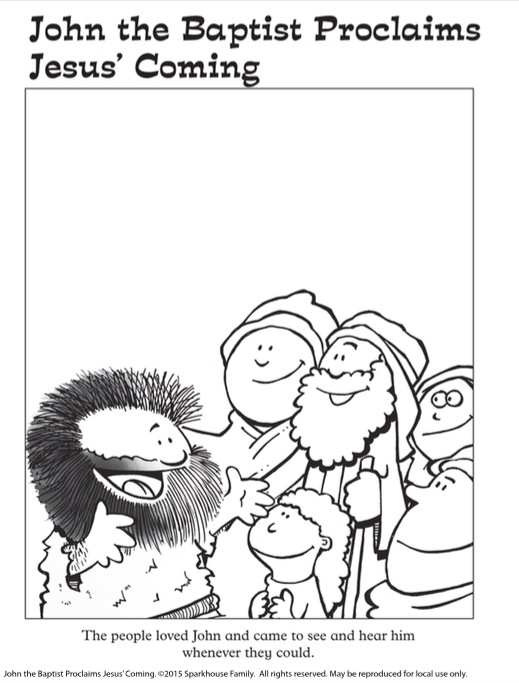 If you'd like to summarize or read a portion of this story to your kids as they color, here's a quick link to John the Baptist's birth in Luke 1:5-45, as well as a link to the passage where John the Baptist proclaimed Jesus was coming in Luke 3. Learn more about the Spark Story Bible here.